Think defending Zion Williamson is hard? Try photographing him in mid-flight. Just like the defenders in charge of marking him, photographers at Duke games can never let their guard down. When No. 1-seed Duke takes the court Friday night in Columbia, S.C., take a close look at the baseline. There will be photographers lined up, their cameras tightly trained on the action, all of them waiting for one moment. 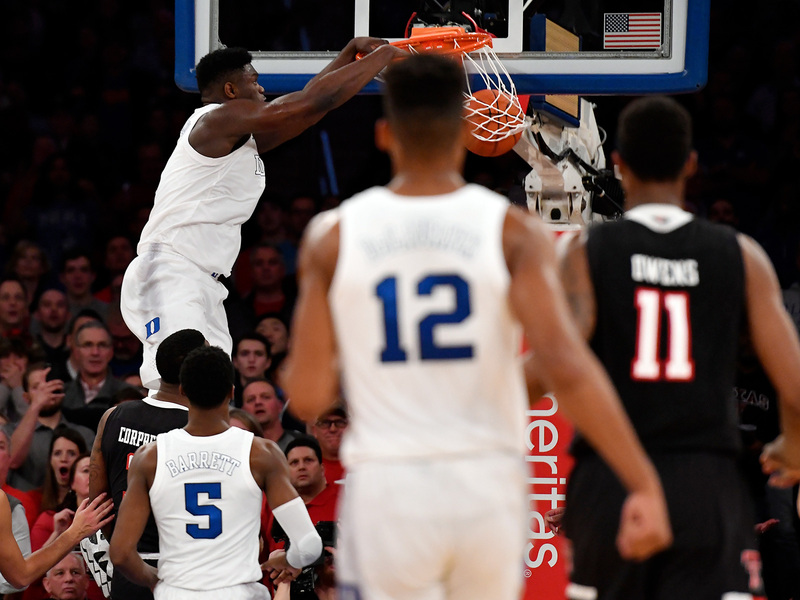 It’s the one play that’s dominated the college basketball season, the one image that every editor wants to run, the image that no photographer working a Duke game wants to miss: the Zion Williamson breakaway dunk. In the blink of an eye, Duke could force a turnover, start a fast break, and Williamson could be flying through the air, cocking his arm. If you capture him mid-flight, it’s an image that evokes Jordan and LeBron, an image that depicts athleticism at its highest form. It’s basketball as art. The preparation starts hours before the game, when the photographers arrive at the arena. Typically, they’re given assigned spots from where they can shoot during games. But some photographers like to take matters into their own hands by setting up a few remote cameras around the arena. These cameras are useful for photographing Williamson because they typically use wider lenses; they capture more in the background and give the picture a sense of scale, a sense of place. Not only will it capture the dunk, it’ll get dejected opponents in the background. A remote camera can turn any Zion Williamson dunk into a Greek tragedy. But getting that shot proved to be tricky when Duke played at home this season. Cameron Indoor Stadium is a smaller, bandbox-style arena that seats less than 10,000 people, which means generally there are not many places to station remote cameras. There isn’t a catwalk above the court, which would be perfect for shooting aerial views of Williamson’s dunks. The basket is also hung from the ceiling, not supported by a stanchion, which is usually a popular place to stash a remote camera. Plus, there isn’t the same network of metal railings in the stands, which would allow for photographers to get creative with new remote camera angles. Luckily, these issues should be alleviated once Williamson reaches the NBA. Once the game starts, the photographer is often armed with two handheld cameras for those “tight” shots. One is a long lens, for taking pictures at the other end of the court, and the other is a shorter lens for the near end. Typically, the remote cameras have been programmed to fire simultaneously, whenever the photographer uses one of the handheld cameras. When Duke is on defense, Lecka has a number of scenarios running through his mind: Has this other team been sloppy with the ball? Is Duke running a half-court press? And most important of all: Where’s Zion? That turnover could be coming at any moment, leading to a Blue Devils fast break. At that point, they just start clicking like crazy. Meanwhile, the remote cameras are somewhere in the arena, snapping away, too. “You can’t really see anymore what’s going on in the [handheld] camera,” Broome says. “You just hold the button down, and if you’re lucky, you might have 5 to 10 frames of it. If you’re really lucky, a couple of them are real good.” The hope is you end up with a photograph of Williamson mid-flight, his face in focus, the ball somewhere visible, with no players, referees or stray limbs obscuring your view. The cruel part is, the photographers won’t always know right away whether they got The Shot. Usually when there’s a lull in the action, a photographer will sneak a peak at the back of the camera to review their recent pictures. This is called “chimp-ing,” because, as Liddy puts it, “you look like a monkey when you’re looking at your camera.” But when Williamson is on the court, photographers are afraid to “chimp.” They don’t want to risk missing another big moment. Instead, they wait until there’s a timeout, when the coast is finally clear.